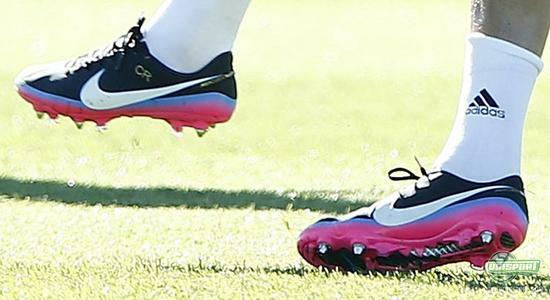 Yesterday Christiano Ronaldo drew more attention than usual, by using a pair of black boots during Real Madrids Sunday-training and today the hype has continued, because Christiano was once again wearing a black/blue/pink Mercurial boot, with a massive Nike-Swoosh at training  and we take a closer look, at what it could be Ronaldo's playing with. When Vapor VIII ACC Retro/Total Orange/Challenge Red hit the stores, Ronaldo was, as one of the Mercurial-collections front-figures and most avid users, not slow to get his own pair - but now the Portuguese superstar is being spotted wearing a different colour to his turquoise Vapors. Ronaldo trained both Sunday and Monday in a black boot with blue, pink and white accent-colours  and the rumours have naturally begun floating around the various social media-sites, whether it's a new colourway or more intriguingly a new model in the Mercurial-collection. There's definitely no doubt, that it is a mercurial Ronaldo is playing in, as the name is embossed on the heel of the boot. The boot itself, does look a lot like a Vapor VIII, both shape wise and also when looking at the stud-configuration, but the boot-design, with the placement of the Nike logo is like nothing else we've seen on the earlier versions of the Vapor VIII. The two big white logos, that are symmetrically placed on each side of the boot, stand out in glorious fashion on the black background. Last time when Ronaldo played in an extraordinarily designed football-boot about a year ago, his 3. Safari-model was introduced, and back then the opinions were very divided. There can be no doubt, that somethings definitely in the makings and we will probably find out fairly soon, what it is Ronaldo's playing with. That's why we suggest you keep a sharp eye here on Unisportstore.com, as well as our Facebook-page, where we will be keeping you up to date on any development concerning Ronaldos boots. Now that you've seen some close-ups of Ronaldo and the boots he used in Sundays and Mondays-training, tell us what do you think of the design. Is it cool with the big Nike-Swoosh on the side, or are the bright colours too much? Share your thoughts down bellow.